Images courtesy of Lakewood Brewing Co. Following its debut at the brewery's fourth anniversary party last weekend, Lakewood Brewing Co. will unleash Lion's Share IV on the public beginning Monday, August 8. Lion's Share IV (12.4% ABV) is a Belgian-style quadrupel that's been aged in freshly-emptied brandy barrels. It's brewed with caramel and roasted malts, along with Belgian candi sugar, to give the finished product notes of dried cherries, figs, raisins and toffee, which intermingle with a subtle warmth that emerges in the finish. Lakewood has released in bottles. "Since our start in 2012, we knew we wanted to celebrate our fourth anniversary with a Belgian quad," said founder and president Wim Bens. "We went BIG for this year's vintage, crafting one of the highest ABV beers we've ever made. I'm excited to share it and look forward as we say 'Schol' to the next four years. 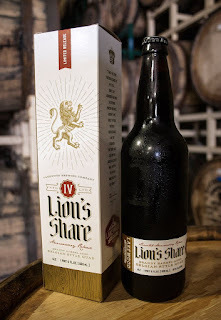 Past editions of Lion's Share were available on draft only, but Lion's Share IV is being released both on draft and in individually boxed 22-ounce bottles. Look for it at select craft beer retailers next week.